Thank you for allowing Atlantic Water Investigations Limited the opportunity to present our services. Incorporated in 1993 we have conducted thousands of well and septic and radon investigations on residential properties in Nova Scotia. Dean Walker, M.A.Sc., P.Geo. 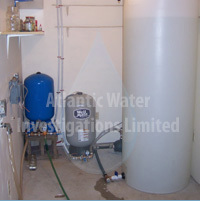 of Atlantic Water Investigations Limited has been licensed since 1996 by NSE and conducted over 6000 well and septic inspections. Are you purchasing or selling a home? Click here to find out why you should contact us. "PRESALE PRELISTING INSPECTION PRICE LIST"
and have no vested interest, and can provide you with a totally unbiased, objective evaluation. Recipient of the Buster" Brown Founders Award, presented in 2011 from the Nova Scotia Groundwater Association to individuals from within the industry who have proven their perseverance and ability through skills they have obtained from experience and/or training or have done something remarkable for their customers. If you need more information and would like to retain our services, please call my cell 902-497-2922 or e-mail to dean.walker@awil.ca.